Google+ Raising a Trilingual Child: 7 principles to keep in mind while teaching your child to read. Parents these days face many difficult decisions, no matter if their kids speak one language, two languages or three languages. One of them is whether or not teach children to read in an early childhood, before the school's formal education starts. Some parents decide to wait, thinking that kids will otherwise get bored at school, some step in and provide the reading instructions before elementary school thinking that being "prepared" will help children along the way. I can understand both parents' positions; nevertheless, experts on this topic see a great benefit in engaging children in pre-reading activities early in life and at preschool. Doing some rhythm and phonic related activities that help children slowly establish letters-sounds connection and prepare them for more formal instructions. - one has to practice to become a successful reader. Bilingual children's parents have even a bigger dilemma on the table: should they start teaching their children to read in the minority language before they learn to read in the community language? Can they teach two alphabets at the same time? The answer to this question really depends on a particular child, languages s/he speaks and a particular family situation. Some children do not mix the languages and are ready for simultaneous instructions, some will do best if they start learning to read in one language only. What is important that your bilingual child actually works towards learning to read in one of the languages, as he will be able to apply the reading skills to another language or languages later. When my son was born, I made a decision to give a try and teach my multilingual kid to read in the minority language before he will be taught reading in the community language. My decision was mostly based on my desire to avoid possible confusions due to the alphabet differences. Russian alphabet is Cyrillic and not Latin. Russian "P" is "R" in English, Russian "H" is "N" in English, and there are many other totally strange looking letters. :) I felt it would be good to give him a head start and allow for the Russian alphabet absorption. Because my little boy enjoyed reading alphabet rhyme books very much, I used this unique opportunity to teach him letter sounds. I write about it in Teaching the Letter Sounds Before Letter Names post. By 18 month he mastered all the letters and could read them in a second. Unfortunately, I had to slow down with my "lessons" when his little sister was born. Only a year later I was able to dedicate more time to teaching him how to read. I would snuggle on a couch with my son and we would looked together at the book we just received - a practical guide "How to teach a child to read" ( "Kak Nauchit Rebenka Chitat' "). This is a great book by Olga and Sergey Fedini that teaches children to read in Russian. I started reading aloud Russian syllables from the first chapters making silly sounds. It worked! My son laughed repeating them and even started reading by himself. He did not even noticed that he was learning! If you are teaching your child to read in Russian, I also recommend a book by Tatiana Bokova Kak Nauchitsya Bystro Chitat . By no means you should be stressed about teaching your child to read before school. I had much less time and energy to work on reading with my daughter, but I see she is also doing very well. We work on her reading a little bit everyday and she has already figured out how to read syllables! And she is not 3 yet. Also it really helps to have a big brother as an example and, I guess, a multilingual brain with all neurological connections developed. I always keep in mind the following 7 principles while teaching my son and now his sister (who is a totally different kind of learner!) to read, that can be implemented by parents of monolingual, bilingual or multilingual children. 5-10 min for children below 4 years old and 10-20 for older children. 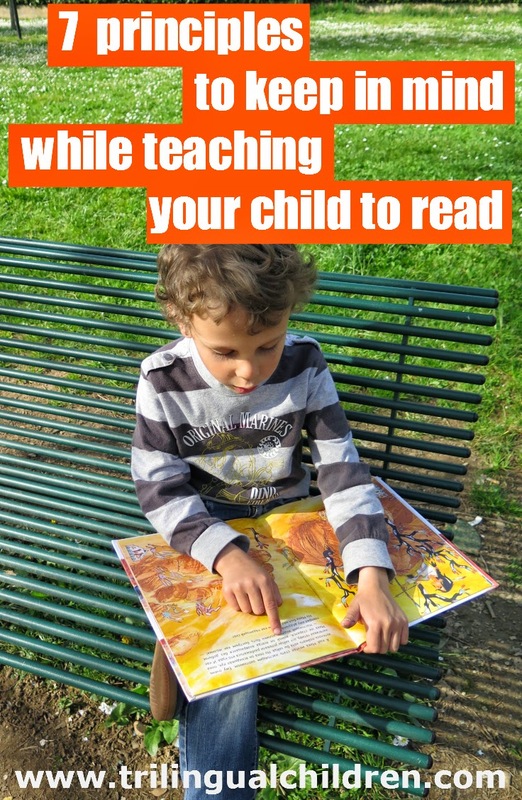 It could be just recognizing the letters or reading titles in a book you read to your child. You don't need to make your child to sit behind a desk, this is a very informal activity and could be part of you daily routine. You are already reading books together - incorporate some elements of reading into it. Even one seemingly insignificant daily practice gives good results in a long run. 2. Use letter sounds instead of letter names while teaching the alphabet. Read also Teaching the Letter Sounds Before Letter Names . read the all possible combinations of two letter syllables first (BA,BE,BI,BO...) then move on to three letter words and then four and so on. Your child should also be able to connect two letters together "B" "A" is "BA"
4. Do not use "and" or any other extra words to connect letters together. For example: MA - instead of saying "M" and "A" , say "M" "A" together is "MA". 5. Practice recognizing letter sounds in words. Ask what letter or letters represent certain sound and write it down together. I do it often while kids are drawing something. We talk about what they draw and I ask to tell me what letter sound the object they draw start from. I repeat the word several times and we listen. Then I or my son writes the word letter by letter. I do not wait long for an answer - I help the kids, if I see the kids have difficulty to recognize sounds. This activity should be a fun game and not a lesson. This audio was recorded, when my 3 years old child came to me while I was working on the computer and had a piece of paper and a pan near by. She asked me to write something with her and we spelled out grandparents names in Russian "dedushka" and "babushka". explain the change in letter sound and practice with syllables and short words. It is too early for a toddler or a preschooler to have formal lessons. If a child prefers to play with a ball instead, just do it! You can teach your child letters during other activities. Be creative! Those are the general rules that you could adapt to your language. Two languages might have a different sound for the same letters. I just tell my children that this is the way the letter sounds in Russian and this is the way it sounds in Italian. Some Italian letters have multiple sounds, so I provide both sounds and tell that in different words the letter sound differently. I explain the reading rule only if I see that the children are ready to listen. Also I have a proof that reading skills are transferable from language to another - I witnessed that myself! My son read a sign at front of our house that is written in Italian : "Pedoni a destra" ("Pedestrians on the right"). All by himself! I hope my 7 principles will help you in teaching your child reading in your language and the results will give you as many positive emotions as it gave me. I was over excited when my son could hold himself on the water, but I could never guess how I would explode with emotions, when I heard him reading his first words aloud sitting with a book, far from me and totally on his own! Good luck! and please share your tips and teaching to read experiences below. Share this post if you liked it via sharing buttons or just simply copy and paste the link. Thank you! English language Reading Rules for kindergarten power point presentation on TeachersWeb. Bilingual child: when to start reading? Multilingual Family Interview: When your home languages are different from community language. Plus resources for teaching phonics and reading in English. What should I order? Mortadella alphabet! Thank you, Galina, for the interesting and useful post! I will try to get these books as our family would like to introduce minority languages(Russian and Spanish) before the community language. Thank you, Anna! How old is your kid now? I think it is a great idea to expose your trilingual child to both minority languages first, starting with books and alphabets. Minority language reading skills will later support your child while he is learning to read in community language at school. Well done, mama! Honestly, I haven't seen much information about reading not being a natural process in contrast to learning to speak--but that makes sense. I like how you manage to break the task of learning to read into simple steps and don't encourage pushing children before they're truly interested. Thanks for your post! My son attends a dual-language immersion school (Spanish-English) in the US, and they very deliberately teach the children to read and write in Spanish first. It bothers some of the parents, but I think it makes sense, because it reinforces the heritage language for Spanish-speaking families, because the kids are getting English everywhere else, and because the the sound-spelling correspondence in Spanish is much more consistent than in English. I have often wondered, though, what the differences would be if my son were learning a language with a different writing system! Thanks for sharing what works with your kiddos. Very interesting, especially as we have cyrillic lettering (Serbian) and English. Unfortunately my husband is the native Serbian speaker, and I'm not 100% on my cyrillic yet. I would say that in the last 6 years here I've become fluent (although cases and genders still pose a problem for me). I have been working on phonics with my son, using Starfall, and Endless Reader/Endless alphabet which each emphasize the sounds the letters make but also give the letter's name. Currently my son is home with me (he has just turned 3) and I have begun to wonder about the different letter systems and how to proceed. I'd like him to attend a Serbian preschool to aquire propper serbian, I am not at all concerned about him aquiring English (I am an English teacher here). My thinking was to have him learn English phonics with me, and allow the school to teach him cyrillic, but do you think we should begin those at home as well? (To be honest I would most likely benefit as well). Where do you live? Which of your bilingual child's languages is the community one? 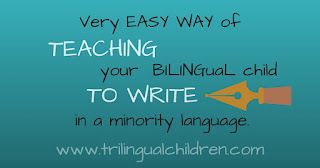 I would teach reading in minority language first, as a child will learn reading in community language at school. When a child masters one language, he will be able to learn to read in another language fast. In any case, if your child asks you to learn Serbian letters as well, allow the father to do it. Unless Serbian is a minority language - in that case I would ask your husband teach both of you in the evening, so you could continue working on the letters with the baby during the day. Ask your husband to search Internet for some material as well. You should not miss this natural curiosity, as this is the time when a child learns new things almost effortlessly, without pushing on your side. If you find some interesting resources in Serbian, please share it with me, so I can make it available to others. Thank you!